Word began circulating yesterday that Round Two notifications for the Disney Mom's Panel were arriving in inboxes. My heart started beating faster. I spent a couple of hours checking my email every five minutes until it became apparent that I was not moving on. Boo. Talk began circulating before I closed my computer down about how many had moved on. Everyone was in agreement that the number seemed low. Theories started to pop up. You know how you feel like something is right? I'm talking about feeling way down deep in your bones that something is right for you. 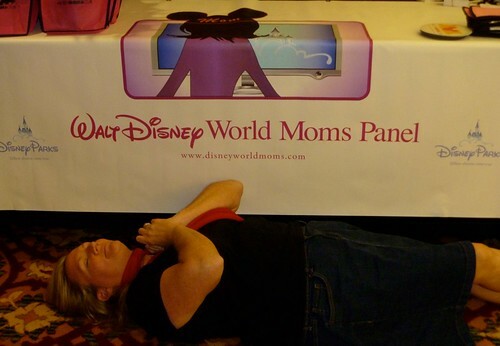 That is how I feel about Disney Mom's Panel. The funny thing is there were up to 20,000 other applicants who felt the same way. I am bummed today. I am a little sulky, no point in lying about it. However, I still trust the process. I would like to think that there is something wrong with the process and that's why I wasn't selected but my brain won't let me. My self esteem likes to revert to middle school and tell me I just wasn't good enough, but that isn't necessarily true either. The truth that I see is that Disney has had years of wonderful panels with incredible women(and men) and I have had the pleasure of getting to know several of them. Disney's process has and does work. I cannot wait to see who makes it onto the 2011 Mom's Panel, and I will be hoping to join them in 2012. Sorry you didn't move on to round two. But I still think you are fabulous! Thanks Jodi and Christy! And exactly, there are so many well qualified applicants! I'm just moving on to planning our next trip!! and hoping I get to go back for Disney Social Media Moms! Aww! I want to give you a big hug!! A great post. And a great photo. I am sulky today too. Okay, I am taking everyone up on those hugs the next time we're together!!! And Traci, I think it would be awesome to be on the panel with you! We have a while to make plans!! I hope you make it to the Disney Moms Social Media Moms Celebration so we can hang out and talk non-stop about Disney. I am sorry that your dream has been (temporarily!- I hope) derailed. I am lucky to call you a friend and would be honored to be on the Disney Moms Panel with you. For now, its ok to feel sad (I sure have before!! ), but just promise yourself to shine next year- I'll be right here cheering you on again! Oh, Amy! I'm sorry it didn't happen THIS year. You still rock and I'm so glad we got to meet in Asheville!! The best part is that, even in the application process, you've made some awesome friends. I know I have, and so glad you're one of them! Amy, I love that photo. ((Hugs)) I'm sorry that you dream didn't come true this year. I've been there too, but I know now that it just wasn't the right time for me. I hope someday to be welcoming you to the Moms Panel family. I truly enjoy reading your blog and hope to meet you in person one of these days. Does anyone know the magic number? Is it 20? 50 Moms on the Panel? How many people does Disney choose for the Moms Panel? Do you have a headstart if you blog about Disney? Does Disney need a balance between bloggers and those who visit Disney often? So sorry you didn't make it. I'm sure there'll be other opportunities. Although I am reading this a year later I can feel your pain in not moving on. I applied this year for the first time and am sitting on pins and needles waiting to find out ANYTHING. I am desperately trying to convince myself I don't have a chance so I won't be too disappointed if I dont move on but the reality is, I am like you - I feel it in my bones that it is the perfect thing for me. Sigh.... guess we'll have to see what the next few weeks brings.